The pens in which your cats relax in are all heated and insulated for their comfort and health. There is always a fully qualified member of staff on site checking up on your cats and vets are on call 24 hours a day. Throughout the day, we have a radio playing on both the cattery and the kennels to soothe your cats and dogs. Our members of staff are trained to administer medication should your cat be on a course of tablets. Spacious and Clean Facilities for Cats to Enjoy. Cattery in Higher Poynton, Cheshire. The Coppice Boarding Kennels & Cattery offer cat boarding facilities for cats of all breeds and ages. We have heated beds so that your cat can enjoy the same comforts that they would back at home. There are 27 rooms for cats. We supply cat food as part of our service and your cats receive regular meals. However, you are welcome to supply your own cat food if this would be more fitting for your cat. During their time with us, your pets receive 24-hour attendance and there is always a member of staff onsite to check up on them and vets on call. As well as supplying baskets and fleece vet bedding for your cat, we are also happy to use your own bedding and baskets if you require this. 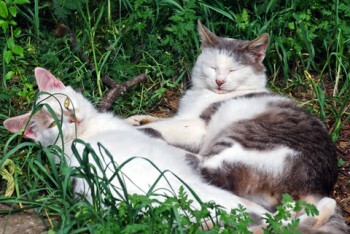 The bedding used by your cats is washed frequently at our onsite laundry during their stay at our cattery.